There's another Grand Ducal tennis fan in Luxarazzi land: A day after Grand Duke Henri, his oldest son enjoyed himself some tennis at the BGL BNP Paribas Luxembourg Open. 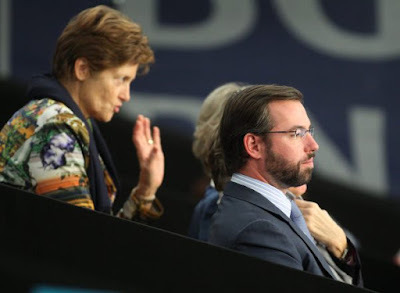 Hereditary Grand Duke Guillaume watched the doubles match between the team of Mandy Minella (Luxembourg) and Julie Coin (France) against the team of Kiki Bertens (Netherlands) and Johanna Larsson (Sweden). The Dutch-Swedish duo won the match 4:6, 6:4 and 15:13. More info at Wort, pictures at Tageblatt. How Many Heads of States Can Fit on a Coin?